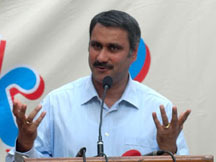 Delhi, 22 July :The Union Health Minister, Dr. Anbumani Ramadoss has reiterated that India should not only be smoke free but it should be comprehensively tobacco free. Addressing a gathering of students at Delhi University, Dr. Ramadoss praised the Delhi University Student Union initiative of smoke free campus and promised that a very soon a smoking cessation centre will be operationalised in the campus. Mentioning the Chandigarh’s decision to go smoke free, the Health Minister informed that the Delhi Chief Minister has committed to make Delhi smoke free before the Commonwealth Games in 2010. Dr. Ramadoss once again announced the Government decision of complete banning of smoking in all the buildings public or private. He emphasized the need to strictly implement the anti-tobacco laws. Speaking about smoking in movies, Dr. Ramadoss said that he is not against movies but when film stars are brand ambassador for health programmes like National Rural Health Mission (NRHM) and Polio Campaign then they should avoid smoking on screen. This is especially important when movies contribute to almost 52 per cent of promotion of the killer habit. Citing the examples of Irish pubs and French Cafes, the Health Minister said that he is confident that with strong will and awareness, it is possible to eliminate deep-rooted evils. He expressed confidence that anti-tobacco efforts will be able to overcome internal and external oppositions. The Health Minister cited statistics to drive home the extent of the menace. He informed that smoking causes about one million deaths every year in India and has emerged as the biggest killer and cause of problems like indebtedness and domestic discord. With the largest population of youth, India needs to go all out against the tobacco use. He said through National Tobacco Control Programme (NTCP), the Government is targeting schools as well as colleges to protect the health and well being of the young population.